Here is a really challenging and effective oblique workout, that uses 4 good oblique exercises. You can use the 4 oblique ab exercises below in 3 different ways to change the difficulty of the ab workout. Straight sets are the easiest, super sets are the second hardest, and a circuit is the hardest. Below is the workout for your obliques. You can click on the picture to go to the page with more instructions about the exercise. This exercise can be challenging the first few times you try it, but it will give you much more muscle work in the obliques compared with side crunches on the floor. Perform 8-15 repetitions on each side. Your obliques should be pretty fatigued after the side crunches on the ball, so you should get a really good burn well you do the side planks with a twist. You can keep your feet stacked on top of each other for more of a stability challenge, or you can stagger your feet one in front of the other to give you a little more support. Perform 5-15 repetitions on each side. Use a comfortable weight, 4-16 pound medicine ball. Perform 10-25 repetitions on each side. By the time you get to this last exercise, your core should be pretty fatigued. Many people find that crunches on the ball are easy, but when you do them at the end of a workout they will feel much more difficult. 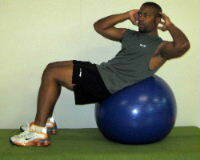 You can perform the oblique crunches on the ball in alternating fashion of simply focus on one side at a time. Do 6-15 on each side. Go at your own pace, and don't be frustrated if you have a hard time getting through the entire workout the first time. And if you don't have access to all the equipment, simply pick other oblique exercises to include in the workout. Return to the Free Ab Workouts Page from this Oblique Workout.